This noir whodunit may claim to be based on a real-life case, but Nico Muhly’s new opera is no verismo. Rather, Two Boys contemplates the sheer constructedness of the world around us – a conceit it parallels with the alternative but increasingly porous sphere of the internet. Teenage choirboy Jake (Joseph Beesley) lay unconscious having been stabbed by his older friend Brian (Nicky Spence). The motivation is unclear, but it seems that the victim had sought to manipulate his attacker by disguising his identity. To uncover the truth, Officer Anne Strawson (Susan Bickley) must absorb herself in a world of shady network forums and cybersex, seeking to gain some handle on the creative possibilities of this strange new language. Towards this end, Two Boys feels like a dark obverse of Philip Larkin’s Jill, a novel that ponders the consolations of literature. Jake too creates a feminine alter ego, but unlike Larkin’s hero he is not compensating for social alienation per se but rather the extreme decentring of space and subject peculiar to the internet age. For Jake, Brian and their contemporaries, there is nothing but the masquerade; their world is reduced to text and image – vacuous signifiers that are easily recalibrated and make every Man a god in miniature. In seeking to expedite rather than to resist his dissolution, Jake’s attempt to author his own demise may be interpreted as bringing the work of postmodernism to its logical conclusion. This thinking is well integrated into the set design, which is formed of large movable sections that are reconfigured to form new settings. There is also extensive use of video projection – the internet looming large over Muhly’s characters as an indistinct kingdom of ghosts. 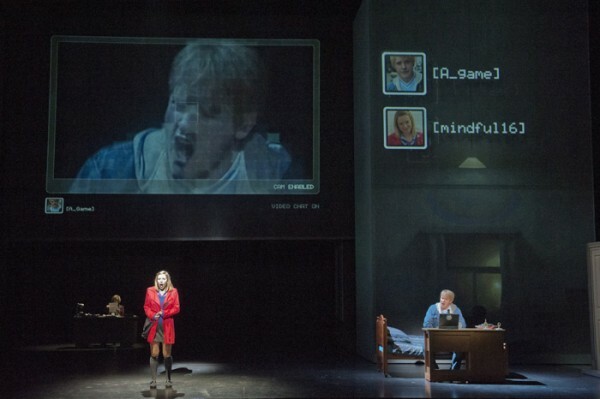 The chatroom conversations that form the bulk of Lucas’ libretto appear above the performers’ heads, so that their words – like their physical presence and their surroundings – appear to emerge from the nebula of digital information that backs proceedings. The design promotes a menacing, disorienting atmosphere, but the decision to contrast the shadowy offices and backstreets of film noir with the phantoms of science fiction makes for a slightly disjointed look. In director Bartlett Sher’s defence, it is difficult to underestimate the lasting influence of The Matrix here, a film that has so resolutely dictated the terms of reference it is difficult to discuss it in any other way; indeed, the length of Muhly’s black cardigan at the curtain call would also seem to hint at a certain admiration for Wachowski brothers. Nonetheless, the overall visual impact is strong and engaging, and its variety provides a basis for fluid plot development. This is also true of Muhly’s score, which diversely incorporates choral themes (the composer’s career in music began as a Rhode Island chorister) and the rich, wall-of-sound repetitiousness we may associate with practitioners such as Philip Glass or Steve Reich. There were some strong vocal performances too – in particular Beesley, Spence and Mary Bevan as Rebecca – but others struggled to be heard over Rumon Gamba’s orchestra. The most notable of these was Susan Bickley, whose performance was otherwise excellent as the downtrodden, booze-sodden detective inspector of pulp convention. More appropriate levels were found after the interval, and fortunately in time to redeem some of the humour the mezzo-soprano brought to her role. As a result, in part, the first act seemed a little leaden and perhaps overlong. Dramatists continue to struggle to with stories centred upon email exchanges, as anyone who has listened to Radio Four’s recent afternoon plays may attest. But here, the careful exposition has furnished us with an explosive finale that sweetens our perseverance. Two Boys will be staged at the New York Metropolitan in 2013.